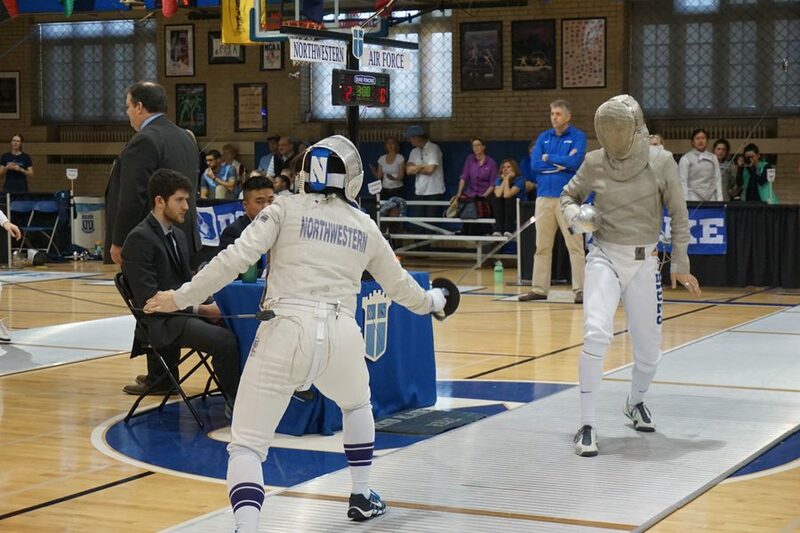 A Northwestern fencer prepares to attack. The Wildcats will travel to Notre Dame to compete at the DeCicco Duals on Saturday and Sunday. With the regular season winding down, Northwestern continues its stretch of five straight weekends competing. The Wildcats will travel to Notre Dame to compete at the DeCicco Duals on Saturday and Sunday. After going weapon-to-weapon with some of the best teams in the country at the Philadelphia Invitational, NU faces a lighter schedule in Indiana, with only one team ranked in the top 10. That team happens to be the defending national champions and current No. 1 Notre Dame. This will be the first time the Cats and the Fighting Irish face off all season despite being the third tournament both teams have attended at the same time. In November, Notre Dame and NU both competed at the Elite Invitational and last week, Notre Dame attended the second day of the Philadelphia Invitational. Notre Dame is 13-1 on the season, with their only loss coming to No. 2 Columbia at the Philadelphia Invitational. The Fighting Irish fell to the Lions 17-10, the same score as the Cats’ loss to Columbia. Notre Dame is led by two-time NCAA Champion sabre Francesca Russo and 2017 NCAA third place finisher epee Amanda Sirico. Historically, Notre Dame has constantly been a thorn in NU’s side. Notre Dame holds a 54-9 edge in matchups all-time, with the Cats’ 0.143 winning percentage its worst against any opponent in program history. At last season’s DeCicco Duals, NU went 4-1, with its only loss coming at the hands of Fighting Irish. With only a few weeks left in the regular season, the Cats have only two more duals to hone their talent before postseason competitions begin. Moss said the team continues to show a great level of consistency and grow stronger as a team. Team unity has been at the forefront of both Coach Moss’ and the team’s mind this season. Junior foil Yvonne Chart said the team could still improve the bonds created with each other.